The United States Congress designated the Marjory Stoneman Douglas Wilderness (map) in 1978 and it now has a total of 1,296,500 acres. 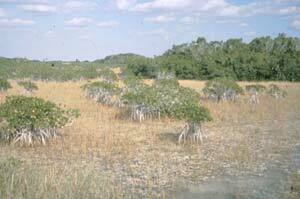 All of this wilderness is located in Florida and is managed by the National Park Service. All life in the Everglades hangs by a wet thread — the fresh water required to sustain the vast and varied species, threatened by human intervention. The thread is growing weaker all the time. This lush but fragile landscape is primarily a marsh of scattered tall grasses. Everglades National Park, which covers about 1.4 million acres, contains only part of the watery expanse known as everglades. The Marjory Stoneman Douglas Wilderness makes up the majority of the park. At the heart of the Everglades is a "river of grass," six inches deep and 50 miles wide, a body of water that flows so slowly the movement is imperceptible. From its origin along the shores of Lake Okeechobee, the river drops only 15 feet on the voyage to saltwater Florida Bay. Don’t be fooled by the river’s placid nature though, for this is a land of indescribable wonder. Scaly alligators share the marshes with flamingos, roseate spoonbills, egrets and herons, pelicans, cranes, hawks, ibis, storks, frigate birds, kites, skimmers, and hundreds of other colorful birds. The shallow waters of Florida Bay constitute a little less than one-third of the Wilderness. Most of the bay’s tiny keys serve as nesting sites for birds, and the salt water teems with fish, bottle-nosed dolphins, sea turtles, sharks, and manatees. You pretty much need a boat to access Florida Bay and the fascinating Wilderness Waterway, a 99-mile marine trail that takes you from Everglades City and the Ten Thousand Islands on the north to Flamingo on the south. Along the waterway you’ll see virtually every organism that lives in the Caribbean. A 38-mile road leads from entrance of the National Park to a visitor center at Flamingo on the southern coast of Florida. From this road, several trails head into the Wilderness, most of them day-hike routes of less than one mile. Four longer trails, ranging in length from four to 13 miles, also can be accessed near Flamingo. When embarking on foot or canoe trails, visitors should carry in all the drinking water they’ll need. Planning to Visit the Marjory Stoneman Douglas Wilderness? How to follow the seven standard Leave No Trace principles differs in different parts of the country (desert vs. Rocky Mountains). Click on any of the principles listed below to learn more about how they apply in the Marjory Stoneman Douglas Wilderness.